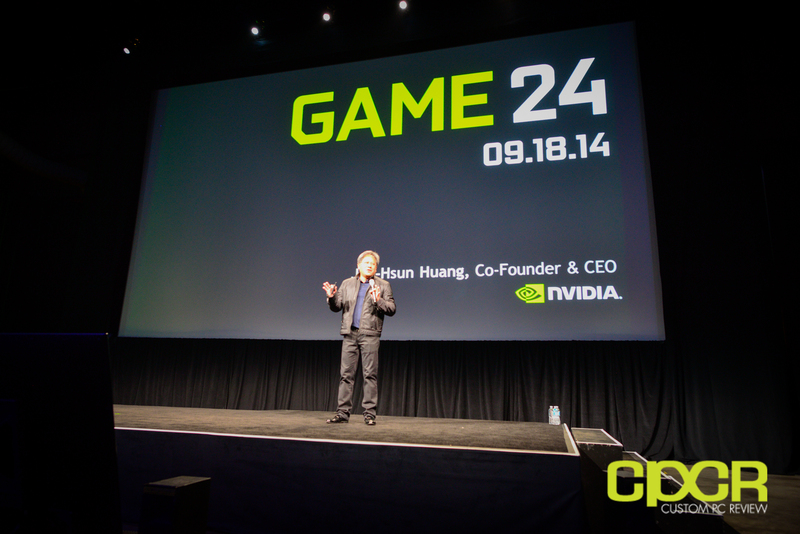 As the event began, the first order of business was a powerful keynote by Nvidia CEO Jen-Hsun Huang where he revealed… you guessed it. Maxwell. 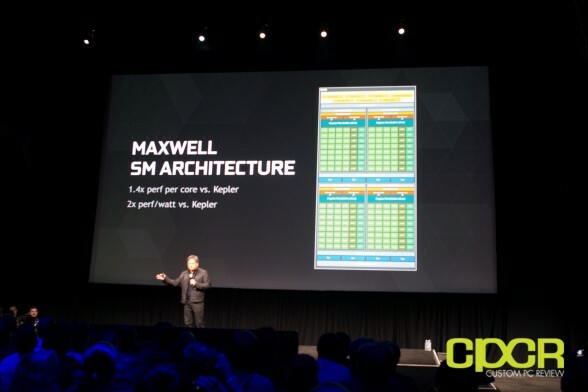 Jen-Hsun Huang began his keynote by first introducing Maxwell’s features. By now, it was pretty obvious that some new product announcements were going to take place. Maxwell’s SM architecture is something we’ve already seen in the first generation Maxwell parts introduced with the Geforce GTX 750 and GTX 750 Ti. 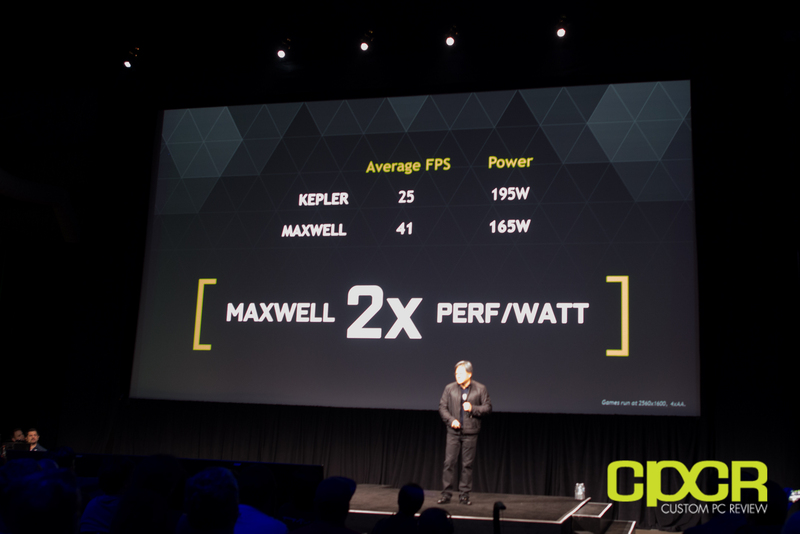 Despite being built on the same 28nm node as Kepler, Maxwell is able to achieve 1.4x performance per core and 2x performance per watt. The Delta Compression Algorithm has also been improved. 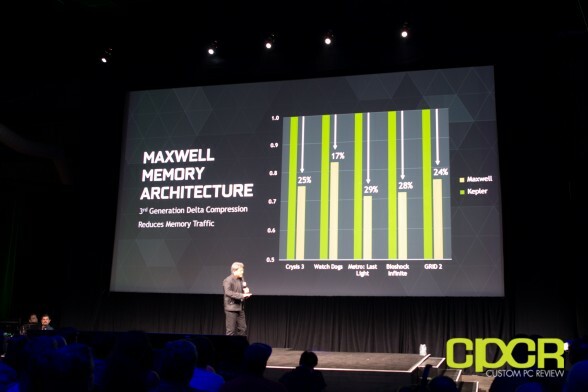 Delta Compression is a method of compressing instructions before sent out to the memory bus as well as before being read by the required application. Here we can see how much more efficient Maxwell’s architecture is compared to Kepler. 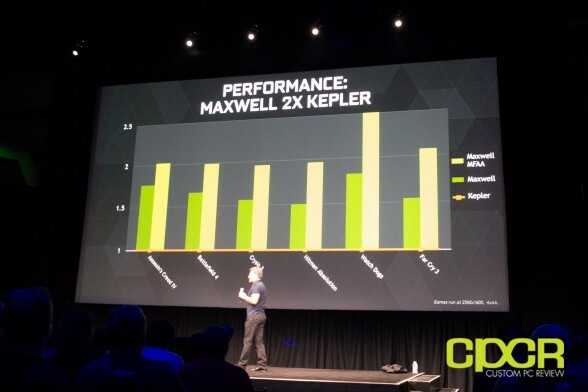 What all that tech jargon sums up is that Maxwell should deliver up to 2x the performance of Kepler. Aside from the obvious performance boost, a big change in Maxwell compared to Nvidia’s previous architecture, Kepler, is that Maxwell is much more energy efficient. Compared to the GK104 based GTX680, the GM204 based GTX 980 is capable of delivering drastically higher frame rates while shaving 30W off of the TDP. Impressive. Nvidia also unveiled two new software features which should help improve image quality and framerates. 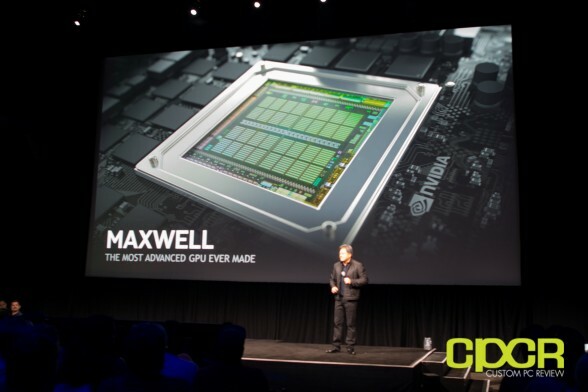 One technique Nvidia introduced to increase image quality is something called the Dynamic Super Resolution (DSR). For those who can’t afford to upgrade to a 4K monitor just yet, but have powerful enough graphics cards to easily do 4K, DSR will force your graphics card to render each frame at at 4K resolution and then downscale it again before being outputted (aka SuperSampling). For example, if your monitor has a max resolution of 1920 x 1080p, each frame will rendered at 3840 x 2060p but downscaled back to 1080p before displaying it on your screen. This should help reduce jagged lines and make older games more pleasant to the eyes. 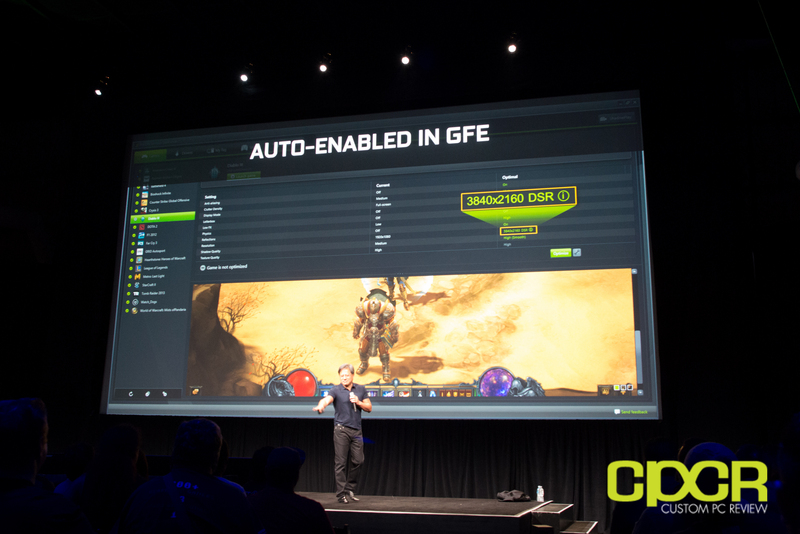 DSR can be enabled via Nvidia’s GeForce Experience software utility. 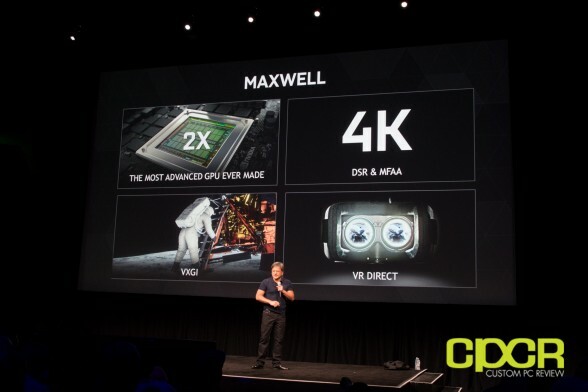 Nvidia is also introducing a new anti-aliasing technique with Maxwell. Dubbed Multi-Frame Anti-Aliasing, this new type of AA aims to achieve the image quality of 4xMSAA at the performance hit of 2x MSAA. 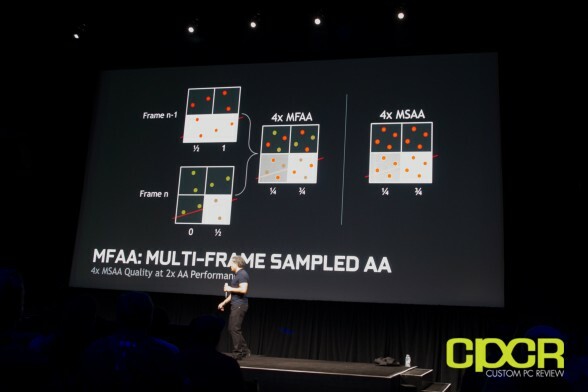 The way this is done is basically by halving the amount of AA in each frame. 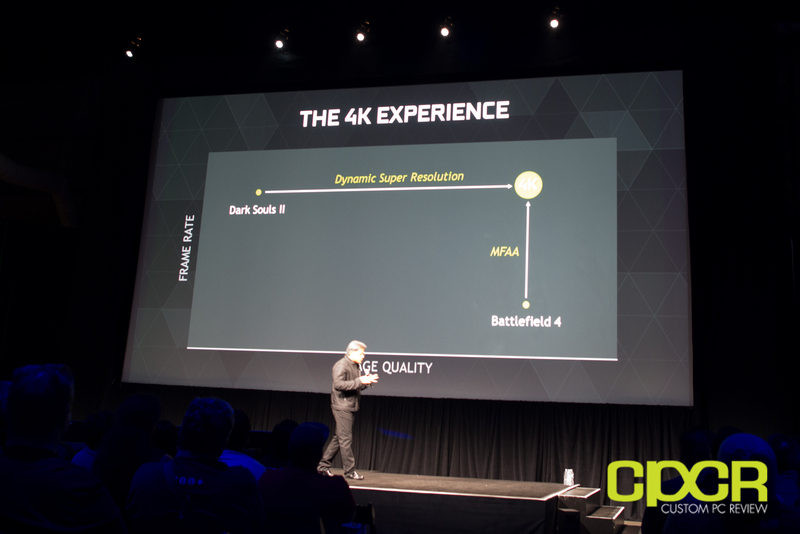 By doing half the AA in one frame then doing half in the frame right after, theoretically your eyes won’t see a difference when a game is playing at say 60FPS. This is an interesting idea which I’m quite interested in looking at myself. Nvidia also proudly introduced VXGI, or Voxel Global Illumination, which Nvidia’s next generation real time lighting technology. The way VXGI works is that it converts an entire 3D scene into voxels, which are groups of pixels in the shape of small boxes. 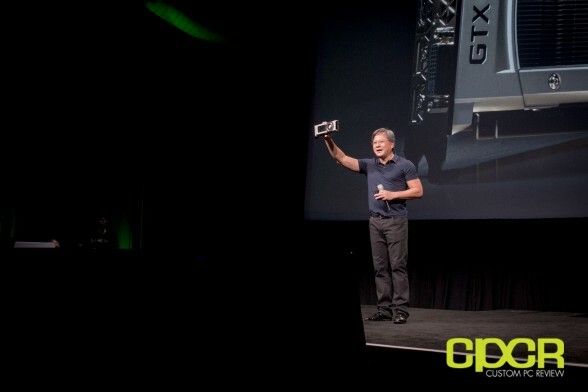 These boxes then have their own unique lighting properties such as how reflective the surface is which allows the GPU to easily calculate how lighting should work in real time. This is much quicker than figuring out the precise lighting of every single pixel individually, which allows VXGI to work in real-time. You can read more about it here. 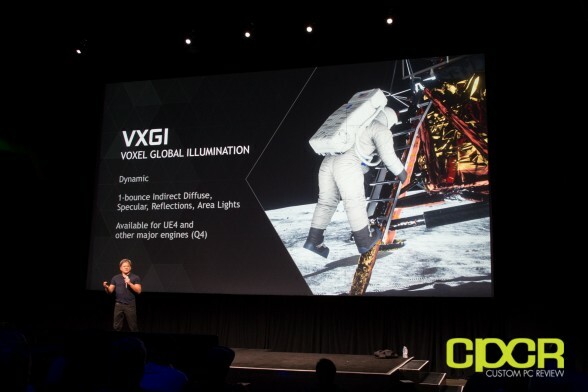 Using VXGI, Nvidia also applied this to the lunar landing conspiracy, further debunking the idea that the lunar landing was faked. It’s really impressive, so be sure to check out the video above. 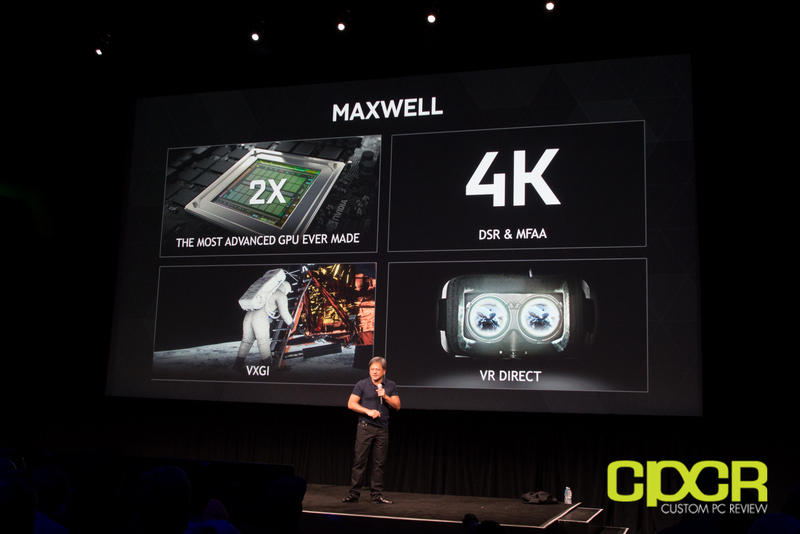 The last feature Nvidia showed off is VR Direct. Aimed squarely at the exploding VR (Virtual Reality) gaming crowd, Nvidia seeks to improve the VR experience by reducing latency. 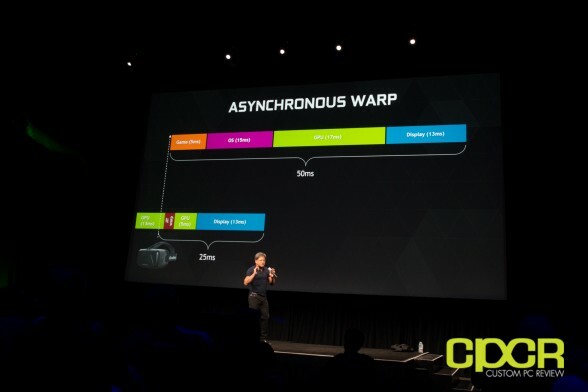 Using several optimizations along with a feature called asynchronous warp, Nvidia expects to reduce the latency down to the magical 25ms or less mark which is the ideal latency for VR gaming. Behold! Nvidia’s next flagship GPU, the GeForce GTX 980. Using the new Maxwell architecture, the GeForce GTX 980 carries 2048 cores and 4GB of memory with a pricetag of $549. … and the proud moment when Jen-Hsun Huang shows off the new flagship card. Beautiful. Immediately following the GeForce GTX 980 is also its little brother, the GeForce GTX 970. 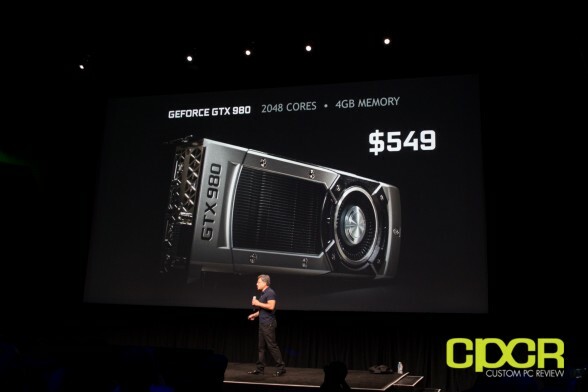 The GeForce GTX 970 is carrying 1664 CUDA cores, but the same 4GB of VRAM as its bigger brother. We were also pleasantly surprised by the MSRP of just $329, which is $70 less than the GTX 670 when it first launched. 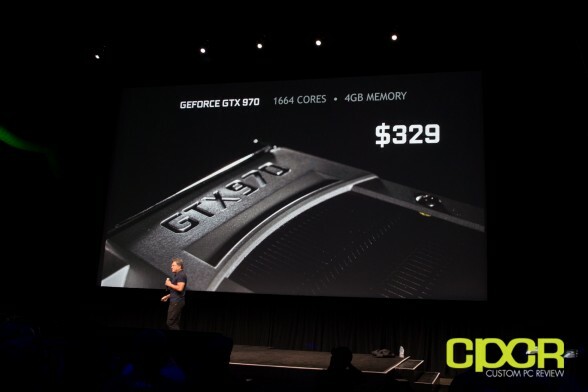 Depending on the performance of this card, it could be seriously disruptive to the market. Hopefully we’ll be getting our hands on one or both of these new cards in the near future, so keep your eyes peeled for a full review!